In recent years, few emoji have caused as big of a stir as the gun — both for what it looks like and what it represents, or represented, at least. The pistol was released as part of Unicode 6.0, the first standard to support emoji. At the time, almost every service rendered the emoji as an actual gun — a revolver or, in Google’s case, a gold-plated blunderbuss. Microsoft was the only outlier, showing a funky alien ray gun instead, though it eventually changed this to a revolver. The emoji has always had a bit of a negative connotation, just like the real-world item it represents, and there are numerous cases where sending it was considered a grave threat. In 2015, a teenager in Brooklyn was arrested for, among other things, posting a series of emoji to his Facebook page that included a cop with the pistol pointed at his head. The same year, a middle school student in Virginia faced felony charges after she posted an Instagram comment apparently threatening her fellow students, which included — you guessed it — the gun emoji. In 2016, a French court ruled that sending such an symbol constituted a threat after a man sent one to his ex-girlfriend. The pistol was far from the only source of gun-related emoji controversy. In 2016, the Unicode Consortium considered a rifle, which would have represented “marksmanship, sport shooting, [and] hunting.” The weapon would have represented the Olympic sport, and a number of other Olympic-related symbols were proposed. While it is a Unicode character, it has no emoji equivalent, meaning for all intents and purposes it only exists in the Unicode database. Here’s the thing about emoji: When one company makes a drastic change, generally others will at least consider following suit for the sake of consistency. This is to make sure no meaning is lost if users with different libraries communicate with each other. After all, it’d be very disconcerting if I, an iOS user, sent my friend, an Android user, a text saying “You ready for this?” followed by the Apple water pistol, and they saw the same message with a revolver. In the case of the gun emoji, the first company to make the change was Apple. The company switched to a more non-violent alternative in 2016, shifting from its pistol to a green water gun. Most recently, Google, Microsoft, and Facebook also hopped on the brigade to replace the realistic firearm with something slightly more cartoonish. Google announced in April that it’d be swapping out the gun for a funky orange Super Soaker. Microsoft followed suit a day later with its own green water pistol. 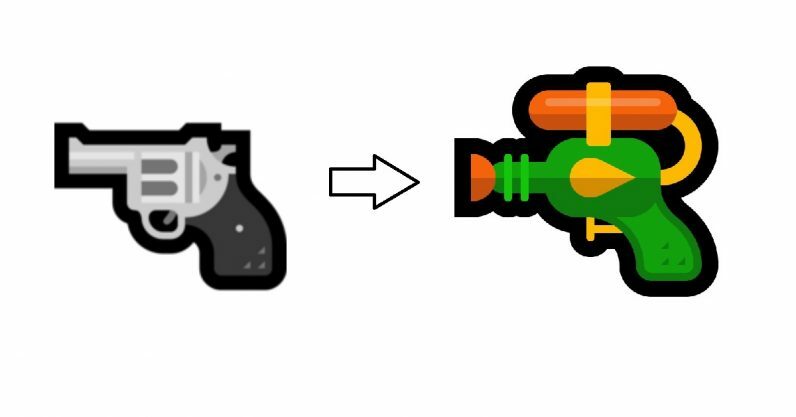 Google was initially resistant to the change, simply stating “we’ll see” when asked by Emoji Wrap if they’d consider adopting Apple’s water gun. It’s not clear whether mounting social pressure or a desire to maintain the aforementioned consistency led to the change. I suspect it’s some combination of both. While opinions may remain divided on whether this emoji is better shown as a water pistol or not, it’s clearly better for cross-platform communication if all companies at least pick one side and stick with it. It’s still going to take a while for the transition to take place, as Google is only testing the water pistol design in the latest Android beta. A lot of Android OEMs are also notoriously bad at providing updates for users, meaning the majority of Android devices will never get the new release. Windows 10 is also testing the new water pistol design in their betas now, with the full release due in the coming months. It wouldn’t make any sense for vendors to switch back now. Whether the emoji will actually play a role in diminishing gun violence is up for debate; but the water pistols are considerably more fun and enjoyable to use than the revolvers and blunderbusses of days gone by.